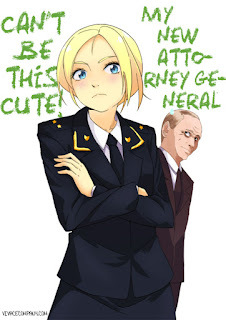 I will post information about the Prosecutor General of the Republic of Crimea, Natalia Poklonskaya from Wikipedia and other links. Natalia Vladimirovna Poklonskaya (Russian: Ната́лья Влади́мировна Покло́нская; IPA: [nɐˈtalʲjə pɐkˈlonskəjə], Ukrainian: Наталія Володимирівна Поклонська, born 18 March 1980) is the Prosecutor General of the Republic of Crimea, 3rd Class State Counsellor of Justice (2015). As an attorney, Poklonskaya rendered public service to Ukraine from 2002 to February 2014, working in various Prosecutor's Offices or as an assistant district attorney. During the 2014 Crimean crisis, she resigned from Ukrainian service and was appointed Prosecutor General of Crimea on 11 March 2014; a press conference given by Poklonskaya on that day resulted in Poklonskaya becoming an Internet phenomenon. After Crimea came under Russian control, her appointment was confirmed by Russian authorities on 25 March 2014, around the same time Ukrainian judicial authorities declared her a wanted criminal. Natalia Poklonskaya was born 18 March 1980 in the village of Mikhailovka, Voroshilovgrad Oblast (today Luhansk Oblast); later in 1990, her family moved to Yevpatoria in Crimea. 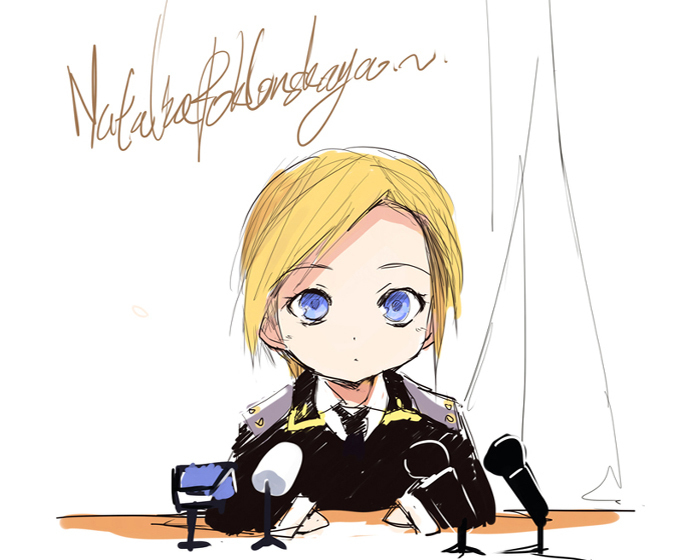 Poklonskaya graduated from the University of Internal Affairs in Yevpatoria in 2002. After her graduation, Poklonskaya worked in the Ukrainian Prosecutor's Office, initially serving as an assistant prosecutor to the Acting Prosecutor of the Republic of Crimea. She was the assistant attorney of Krasnogvardeisky district in Crimea from 2002 to 2006, and the assistant attorney of Yevpatoria from 2006 to 2010. Between 2010 and 2011, she was the deputy chief of a surveillance law enforcement unit of the Prosecutor's Office of Crimea which was responsible for dealing with organised crime. In 2011 in Simferopol, she acted as the state prosecutor in the high profile trial of Ruvim Aronov, a former deputy of the Supreme Council of Crimea. In the same year, she was appointed the inter-district environmental prosecutor of Simferopol. Following that, she was transferred to the Ukrainian Prosecutor General's Office in Kiev, where she served as a senior prosecutor. From October to December 2012, Poklonskaya worked as head of the prosecutors with the proceedings of the Court of Appeal of Crimea, and later after December 2012 up until March 2014 she was a senior attorney of the 2nd division of the General Directorate of Internal Affairs involved in pre-trial investigation and public prosecution management supervision with oversight of law enforcement in criminal proceedings. On 25 February 2014, Poklonskaya handed in her resignation, in which she stated that she was "ashamed to live in the country where neo-fascists freely walk about the streets" (a reference to radical Euromaidan activists). The resignation was not accepted. Instead, she was given a vacation and left Kiev for Crimea where her parents lived. In Simferopol, Poklonskaya offered her help to the Crimean government. Prosecutor of Crimea, Natalia Poklonskaya, during the ceremony of taking the oath by prosecutors of the Republic of Crimea in Simferopol. While the Autonomous Republic of Crimea sought independence from Ukraine, on 11 March, Poklonskaya was appointed Prosecutor of the Autonomous Republic of Crimea. Poklonskaya was appointed to the position by Sergei Aksyonov after the position had been reportedly rejected by four others, including the former Vice-Prosecutor of Crimea, Vyacheslav Pavlov. Her previous criticism of the opposition protests in Ukraine, and the "anti-constitutional coup" led the Ukrainian government to launch a criminal case against her and strip her of the civil service rank of Counsellor of Justice. She was reportedly subject to an assassination attempt on 17 March, on which she refused to comment. Immediately following her appointment as Prosecutor, she was involved in an investigation into the violent attacks committed against Crimean Berkut members. On 19 March, Poklonskaya confirmed that investigations were ongoing into a shooting in Simferopol which killed two while denying reports that the shooter had been detained. She compared the shooting to the "sniper attacks on Independence Square in Kiev" from 18 to 21 February 2014, and stated her belief that the shooting was meant to "provoke violence between the military forces" of Ukraine and Crimea. Crimea, which in the meantime had come under Russian control and become a federal subject of Russia, saw the creation of its new Prosecutor's Office, now subordinated to Russia's Prosecutor General Yury Chaika. On 25 March, Chaika appointed Poklonskaya as acting Prosecutor of the Republic of Crimea for this new office. Around the same time, Poklonskaya was listed as a wanted criminal on the website of the Ukrainian Ministry of Internal Affairs, due to alleged involvement in conspiracy to overthrow constitutional order or seize state power. The Federation Council of Russia declared the charges against Poklonskaya a "bluff". On 27 March, Russian Prosecutor General Yury Chaika granted Poklonskaya the rank of Senior Counsellor of Justice. On 4 April 2014, Poklonskaya gave the approval for the Russian FSB to begin an operation to arrest Yevgeniy Pomelov, the assistant attorney of Yalta, as part of a larger bribery case. On 11 April, the Prosecutor General of Russia personally presented Poklonskaya with her official papers as a Russian legal officer. On 2 May, Russian president Vladimir Putin appointed Poklonskaya Chief Prosecutor of Crimea. On 4 May, Poklonskaya accused the Crimean Tatars' self-governmental body (the Mejlis) of extremist activity, warning that the Mejlis could be dissolved and outlawed across Russia. 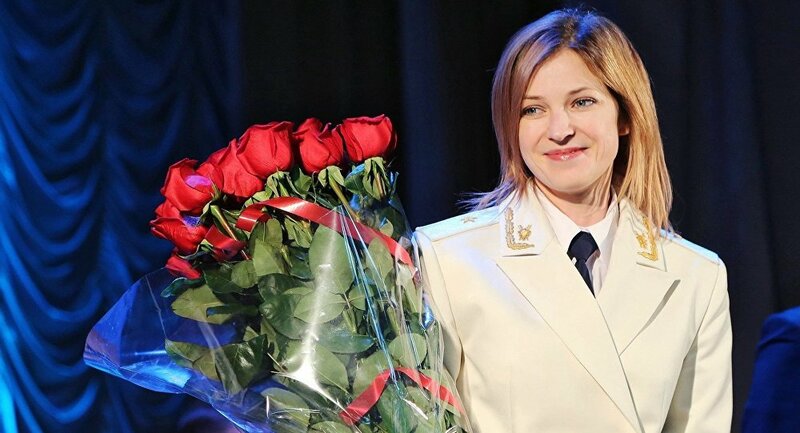 Prosecutor of Crimea Natalia Poklonskaya during the celebration of Victory Day in Simferopol. On 12 May 2014, the European Union added Poklonskaya to its sanctions list. This barred her from entering EU countries and any of her assets there, if existent, were to be frozen. Canada imposed similar sanctions on Poklonskaya a month later, followed by Japan on 4 August. Australia followed soon after, sanctioning the Russian prosecutor on 2 September. 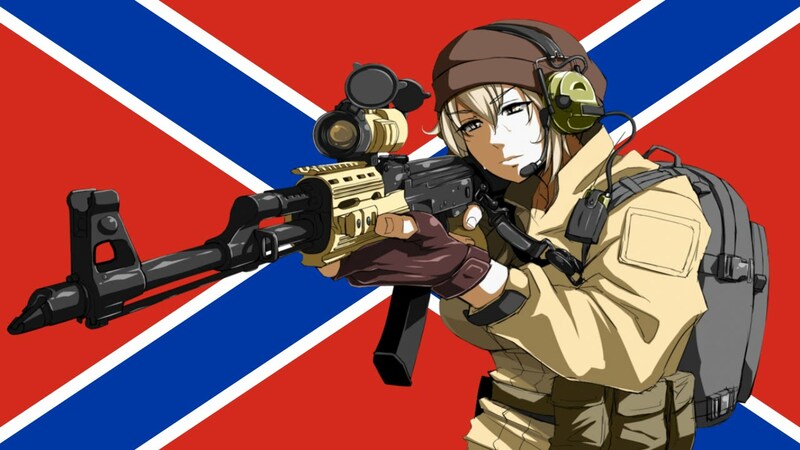 On 19 December, the United States introduced its individual sanctions against several Ukrainian separatists and Russians, of which Poklonskaya was the only woman. In June, Poklonskaya was appointed as a judge to "guarantee impartiality in the selection of winners" for Russia's Five Stars singing competition, which would select Russia's entrant for the Intervision Song Contest. In September, Poklonskaya declared that those who did not recognize the annexation of Crimea by Russia, as well as those who incited ethnic strife, would be deported. Poklonskaya survived two bomb assassination attempts in August and November. Also in November 2014, Poklonskaya was rated as the sixteenth out of the hundred most promising politicians in Russia by the Institute for Social-Economic and Political Studies. 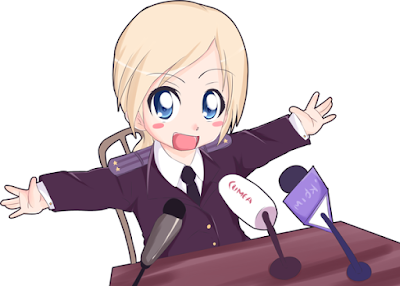 In March 2015, Poklonskaya was appointed as the head of the Japanese-Russian Friendship Society. On 11 June 2015, Russian president Vladimir Putin granted Poklonskaya the rank of 3rd Class State Counsellor of Justice which corresponds with the military rank of Major General. In 2015 Natalia announced that she would be running as an MP in the Duma for the United Russia party. Throughout Russia she is recognised as a potential candidate for the presidential elections in 2018. She is listed at number 16 on Forbes' list of most promising politicians. 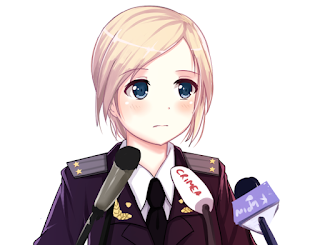 After a video of Poklonskaya at a press conference on 11 March 2014 was uploaded to YouTube, her attractiveness and youth went viral among Japanese and Chinese internet users and also became the focus of attention of Internet communities such as Reddit and Vkontakte, which was reported by international news outlets. Within a month, the press conference was viewed over 1.7 million times. Many fan-created anime-style moe images of her uploaded to the Internet also attracted international media attention. A music video by Enjoykin based on Poklonskaya's press conferences and interviews has had 20 million views on YouTube. Poklonskaya is divorced and has one daughter. Her parents are both retired, living in Crimea, and both her grandfathers died during the Second World War, with only her grandmother surviving the German occupation. Poklonskaya stated in March 2014 that she intends to apply for Russian citizenship. 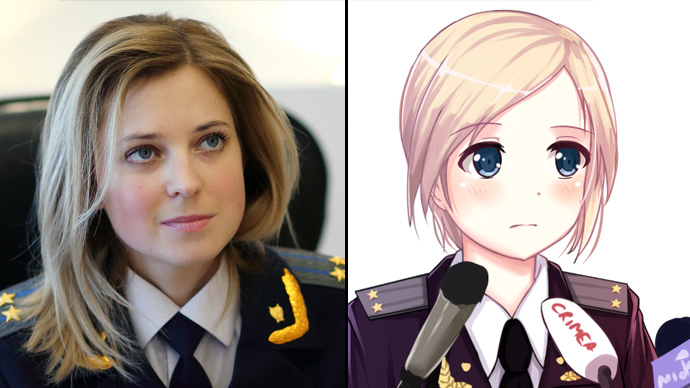 The newly-created Japanese anime icon who is wanted by Ukrainian national security service, Crimea's chief prosecutor Natalia Poklonskaya, says her attractive looks have never hampered her judicial practice and are, well, deceitful. Poklonskaya took the job, which many of her male colleagues feared to accept, just days before Crimea’s referendum on independence from Ukraine, stunning the world not only with her courage, but her beauty as well. During her first press conference on the new position, the 34-year-old blonde didn’t hesitate to denounce the coup-imposed government in Kiev. “The constitution says that the only power in Ukraine – and I repeat – the only power in Ukraine is its people,” she said at the time. 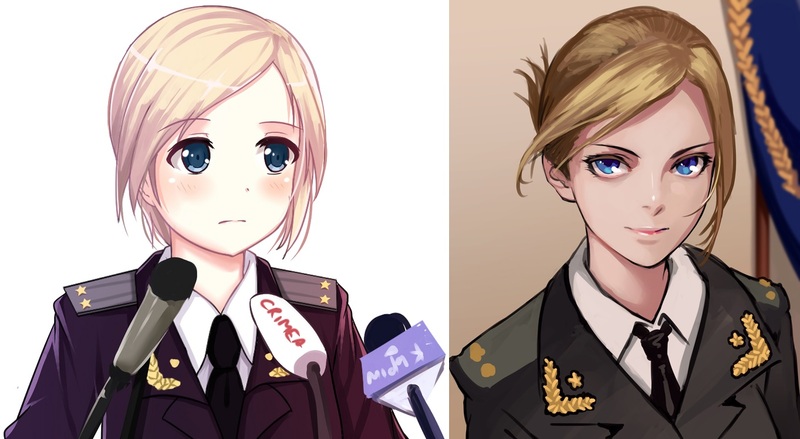 The video with her speech garnered hundreds of thousands of views on the internet in just a few days, with Poklonskaya’s big blue eyes and infant-like looks turning her into a Japanese anime art sensation. Natalia Poklonskaya in Japanese Anime. Some artists even pit Poklonskaya against another famous woman from Ukraine – former PM Yulia Tymoshenko – who promised to leave scorched earth on Russia’s place for its reunification with Crimea. 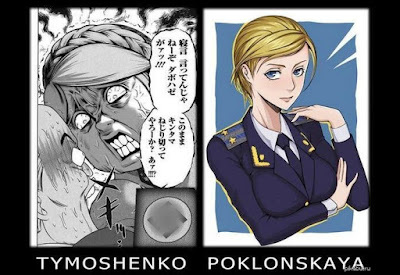 Yulia Tymoshenko versus Natalia Poklonskaya. Natalia says she’s not upset that the Ukrainian authorities have declared the all the ranks and achievements, which she earned through years of hard work, illegal. “The main thing is that this new stage in life begins from square one in a dignified and great state like Russia,” she told NTV. Poklonskaya still hasn’t received her Russian passport, but plans to do as soon as there’ll be a break in her tight schedule. The Republic of Crimea has withdrawn from Ukraine and was officially accepted into the Russian Federation on March 21. The military coup in Kiev led to the Crimean peninsula – home to an ethnic Russian majority – holding a referendum, in which 96 percent of Crimean voters decided to cut ties with Kiev and rejoin Russia. Two attempted terrorist attacks on the Crimean Prosecutor’s Office have recently been prevented by members of the local People’s Guard. So-called ‘prosecutie' Natalia Poklonskaya has also had previous threats. “Several months ago, our guys found a bag with explosives at... the Crimean Prosecutor’s Office and in November it was an envelope with a blasting agent, sent via mail and addressed to the prosecutor,” Sergey Turchanenko, the commander of the People’s Militia told Rossiyskaya Gazeta. “Thanks to the brave attitude toward their duty of the self-defense forces' that serve at the Prosecutor’s Office, we managed to secure it from negative consequences,” Poklonskaya told Tass news agency. Rossiyskaya Gazeta newspaper obtained a copy of Poklonskaya’s letter to Crimea’s leader, Sergey Aksenov. It reveals that on August 18, a checkered shopping bag filled with explosives was found near the prosecutor’s office at night. The casualty radius of the improvised explosive device was reportedly 350 meters. Turchanenko said that the People’s Guard, alongside the police, frequently find packages that replicate explosive devices. Such an accident happened in December at the Council of Ministers building, he said. “It turned out to be a cobblestone inside, but it could have been something different,” he said. The 33-year-old Crimean prosecutor has survived several assassination attempts during her 12 years of service. She was severely beaten up when she jailed one of the leaders of ‘The Shoes’ gang, which was accused of plotting assassinations. 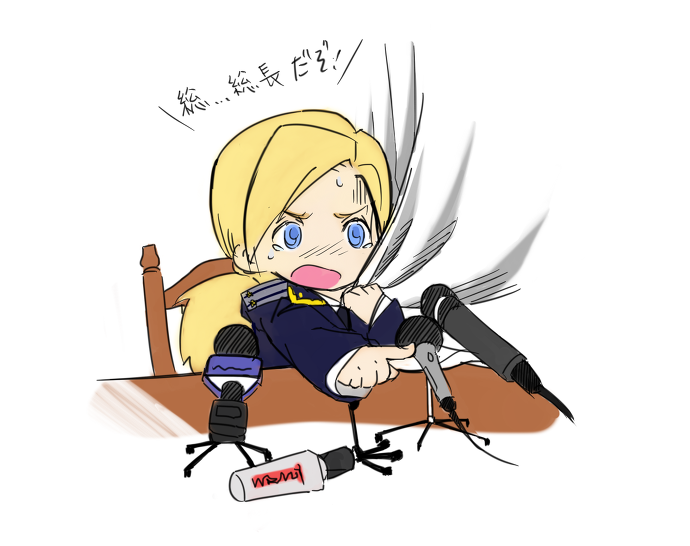 An internet sensation, Poklonskaya earned fame earlier this year after a video from a press conference went viral. Her Japanese and Russian fans even dubbed her ‘Prosecutie’ and ‘Nyash-Myash’. 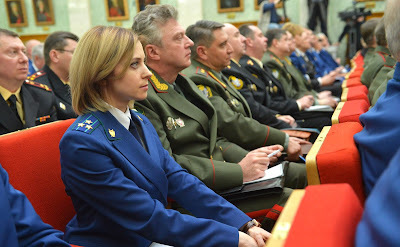 English: Natalia Poklonskaya, Prosecutor General of the Republic of Crimea from 2014 onwards, at the expanded board meeting of the office of the Prosecutor General of Russia on 24 March 2015.